Infinite Art Tournament: Deficit omne quod nascitur(e). The Street Horse featured in this post, two weeks later. Just a quick correction (because I'm a Latin teacher) - it should be nascitur, not nasciture. *sniff* that's the hardest part about this project: when people maim & steal the horses. 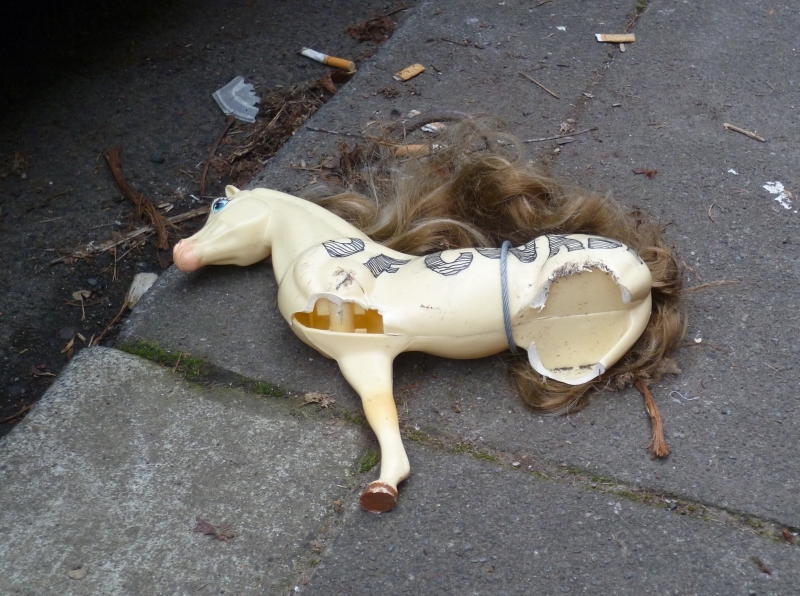 Maybe the horse was playing in the street? PB: Wow, correcting Quintillan? That's bold! But seriously, I'm only seeing it with the final "e" in the various online quotation troves. Now I'm curious about whether you've made an error, whether Quintillan used an irregular dialect, or whether an error has propagated through internet replication??? gl. : I doubt it was intentional. It was in a high-traffic bottleneck, easy enough to tromp on or skateboard into. "Est inuicem consequens et quod ex diuersis idem ostendit, ut qui mundum nasci dicit per hoc ipsum et deficere significet, quia deficit omne quod nascitur."